Once upon a time, before the invention of the internet, access to a range of fascinating topics could be achieved using encyclopedias. Recently I came across a copy of an old encyclopedia, The Modern Marvels Encyclopedia written circa 1938, and originally owned by my grandparents. It was one of my favourites to read when I visited them, with stories about feats of engineering and exploration, scientific breakthroughs, plus many other fascinating human endeavours. 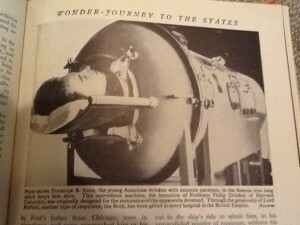 Among all of these wonderful stories is an article on the use of iron lungs to treat sufferers of poliomyelitis. As it has often been pointed out on this blog that many people fail to understand the benefits of vaccination because they no longer see the devastating results of the diseases they help prevent, I thought I would put one of the pictures from this article onto my blog. I’m old enough to remember visiting the Polio Ward in our hospital. I’ve often asked anti-vaxxers why they want to return to those days.